Master Artist Stephen Gyermek gifted us with a remarkable portrait of IF. 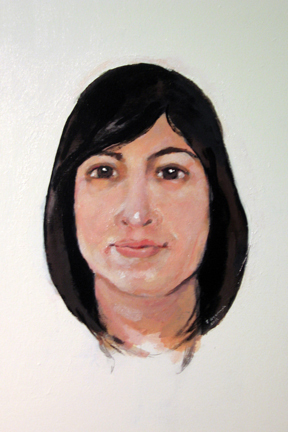 This work marks a new style/exploration in Stephen’s portrait paintings. He gave Ilena his customary fleshly treatment in oils, but chose a bold shape and placed her on a stark white background. He captured her big soft striking eyes and rendered her hair as a sharp sculptural form. It’s always a fun, yet strange, experience to view an artist’s representation of yourself or someone close to you. Composition, color choices and the artist’s ability to look inside and throughout his/her subject often result in something familiar but peculiar. This work was no exception. Initially the stark nature Stephen chose depict her was unsettling in some way. We spent a few weeks with the painting, periodically viewing it and discussing its presence. It’s now framed and has been placed carefully on display among our collection. We’re most gracious to be able to enjoy it; thank you Stephen! This entry was posted in Art Criticism, Painting and tagged Art, Stephen (Istvan) Gyermek. Bookmark the permalink.